← What’s up with the Mountain Safety Council? 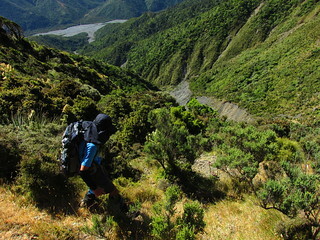 It’s easy to overlook the Orongorongo Valley and surrounding Rimutaka Range, especially with additional tramping options so nearby, notably the Tararuas. That’s something I’ve often been guilty of. Until relatively recently, my most common perception of the range has been from the parts which are easy to reach without much commitment like Mount McKerrow, Cattle Ridge and Turere Stream. 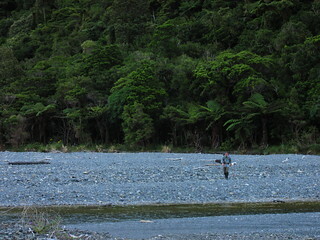 Generally that corner of the range, up and down the Orongorongo River with its lolly scramble of locked private huts and batches hidden in the trees. It’s great for accessibility, but comes with a feeling of being less remote. Last November was a wake-up call, when (mostly on Alistair’s inspiration to re-live his childhood) we didn’t just walk across to the Wairarapa coast so much as found an interesting way to do it. That time we climbed to Tapokopoko, then headed north before dropping into a less visited valley of the Tapokopoko Stream. More recently, in the effort I’m about to describe, we ventured into chapter two of Alistair’s inspiration, following the ridge line south of Tapokopoko. Our exact plan wasn’t clear until close to starting, but with no significant rain for weeks and with fully clear, sunny days in the forecast the potential for being ambitious was encouraging. People: Alistair, Maarten, Bernie, WeiMin, Jessie and me. 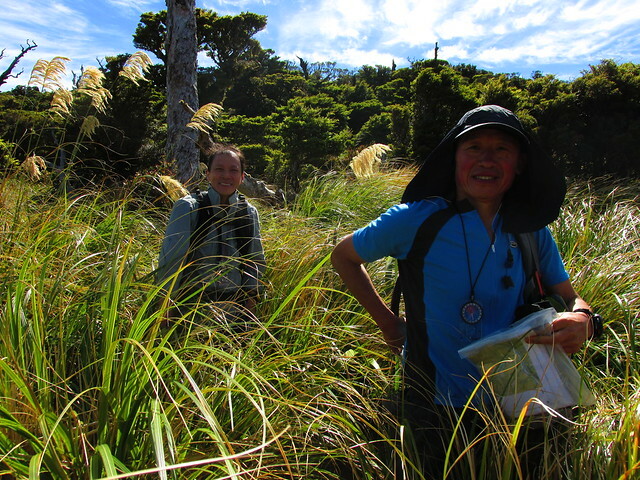 Route: In to Paua Hut for Friday Night, nav up to Tapokopoko (.843), south to .703, up The Peak (.864), further south to sidle under Kotomu (.786), down Red Rocks Stream back to the Orongorongo, and Paua Hut again for Saturday night. Also see: Maarten wrote a trip report for the WTMC newsletter. 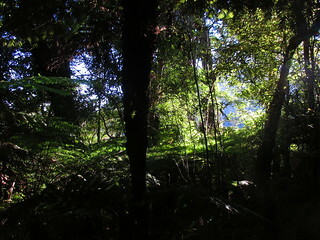 On a summer’s night, there was still plenty of daylight available when we began the easy walk at about 6.45pm on Friday evening, towards the club’s Paua Hut on the true left of the Orongorongo River. Along the way we kept an eye open for the junction with Browns Track, but I can never remember the details of where it begins. Expediency won out over attention to surroundings. Upon reaching the eastern end of Cattle Ridge track, Maarten and Jessie decided to hop back that way all the same, to pick up Browns Track from where it’s signposted along the top, but the rest of us just chose to follow the river. In the end, comparing those two routes, Maarten and Jessie’s speed on such an indirect route matched our casual drifting along a severely dehydrated Orongorongo River. They emerged from the trees almost exactly as we were walking past. 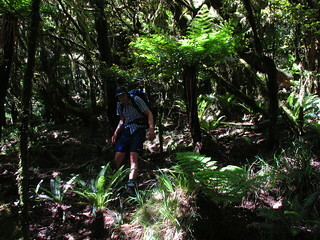 We reached Paua Hut at around 8.15pm. With a such a nice evening, and no rain predicted for the better part of a week, I dragged a mattress outside. No need for a fly. It was great, but the only person to copy me on Friday evening was Alistair, and he’d snuck back inside before morning. Apparently it was cold. 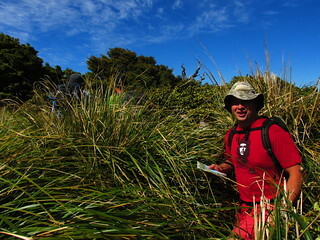 By Saturday morning, we’d more or less decided to walk a loop and return to Paua Hut again for the evening. This would mean we could leave a few things behind, like dinner food and non-emergency shelter. After a tidy breakfast, and some tutorials on how to navigate for several of the less-well-acquainted, we began our ascent at 7.20am. 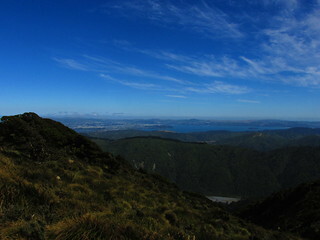 Paua Ridge, at about 460 metres. 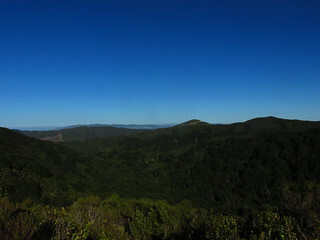 Paua Ridge isn’t officially tracked, but it’s a straightforward climb. There are a couple of places where the obvious route is overgrown and diverges into multiple branches, but there are few ways to get genuinely lost, as I knew from having climbed up here in November. Alistair himself had marked much of it 20 years ago. 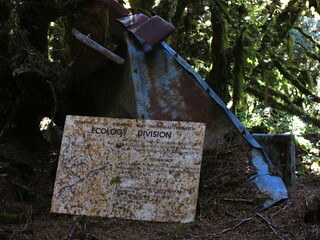 After about 2 hours of casual climbing we stood on top of Tapokopoko (.843), next to the old sign from the Ecology Division of the DSIR, advising about the research it was carrying out here up until it was disbanded 23 years ago and nobody thought to remove the sign. In November we’d travelled north-east from this point, but today’s plan would be to travel south-west and follow the ridge the opposite direction. After 15 minutes of standing around, we set a timer, picked a bearing towards the top of a creek about 500 metres to the south-west, and started following it: bearing bunnies up front, learning to navigate. There’s a joke of a ground trail for a short while. After 15 minutes we encountered at least one tarp which seems to signify someone’s semi-permanent campsite, or hunting base. There’s quite a wide plateau for that first part, and our main aim was to stick to a bearing with a timer, so we may have also missed ground trails in that region. 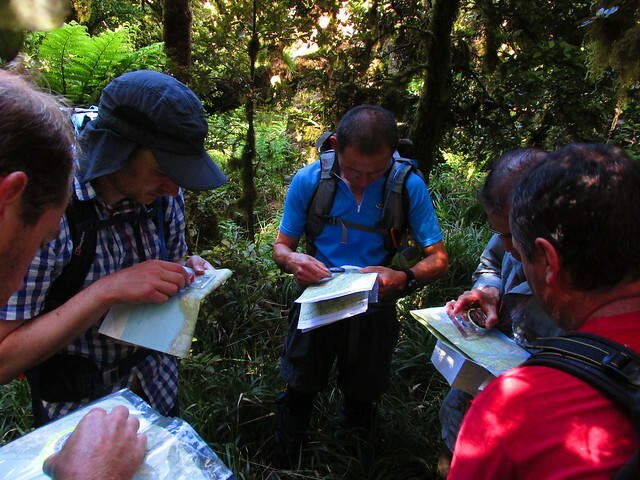 Maarten, Bernie, WeiMin, Jessie and Alistair debating the next steps, at what I think was our first waypoint beyond Tapokopoko. In this terrain whilst navigating, we assumed about 200 metres every 10 minutes, and I think that worked out nicely. LINZ’s Topo50 map suggests the top of two side creeks which feed the Mukamukaiti catchment. By the second of these, which was an obvious gully to us, any semblance of a ground trail was gone, trees were becoming scrub, and we made a couple of false starts in figuring out the optimal route around it. This is not because it was especially dangerous, but because the scrub was consistently about chest-high, and happily obscured where the ground was, or wasn’t. Furthermore, it’d be the story of the day. 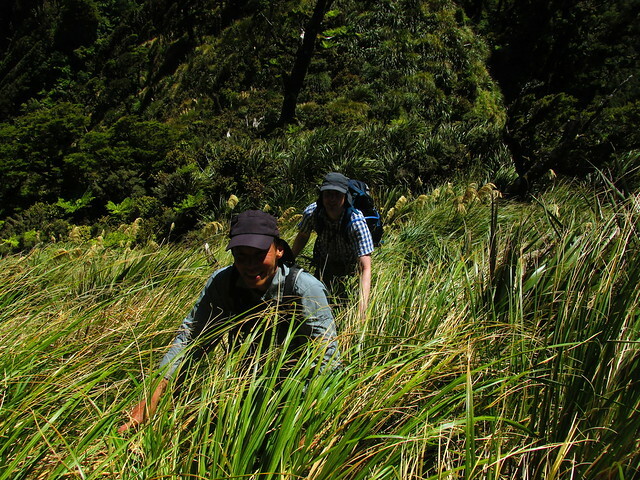 Nice, open fields of tussock from a distance which would take us considerable time to traverse. To top things off, the tussock here had largely taken over from what used to be a forested ridge-line, until storms had blown down many of the trees in the past few decades. So as well as a generally obscured ground, the tussock obscured decades-old treefall, and the types of gaps and drops underneath this sort of treefall. 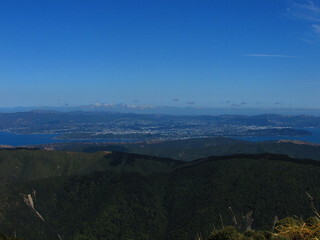 Wellington Harbour from the Rimutakas. It wasn’t deeply unpleasant, mind you, aside from the scratches and the occasional gashes. This was the perfect, bright sunny weather for this type of expedition. I could imagine it would be much less pleasant in wind and rain, or worse. 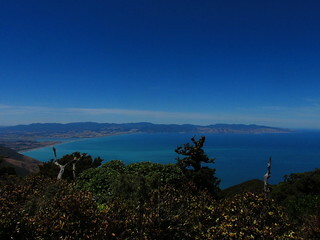 Frequently we’d look up at the surroundings to see panoramic scenery of the Kaikouras, the Marlborough Sounds, Wellington and the Hutt Valley, and often over to the Wairarapa. 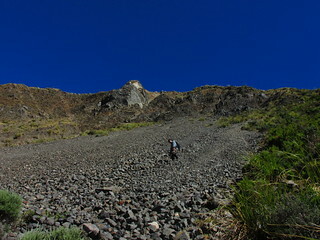 Closer to home, Maarten pointed over to the location of the Baker Track on the opposing ridge across the Orongoronga valley. According to maps, even modern LINZ maps, there’s meant to be a track coming east from height .376 into the river, but Maarten reckoned it either doesn’t exist or is overgrown. into the saddle north of .743. We continued to follow bearings, with the first significant waypoint being a saddle north of spot-height .743. We stopped for a rest a the point which, at the time, we’d thought was roughly on the shoulder of this saddle, although some studying of the map suggested that nearby ribs weren’t lining up on the right bearings and we soon found the terrain was deceptive and we’d come even less distance than we’d thought, stopping near the top of a slip on the north-western side of the ridge, at about the 720 metre mark. It was 10.55am, 1 hour and 15 minutes after leaving Tapokopoko, and we’d travelled roughly 1 kilometre. From here, our next goal would be spot-height .743, prior to a turn to climb up towards The Peak (.864). From where we sat, part of our problem was simply to identify this point. It didn’t stand out very clearly. Maybe that had something to do with the light, but we identified it, set a bearing straight for it, and at 11.30am we dropped into the saddle and out of sight back into the scrub and low trees, navigation bunnies up front and in the middle, keeping track of and correcting the bearing. We covered that 700 metres to spot-height .743 in about 45 minutes, arriving at the peak at about 12.15pm. I think it was somewhere in this vicinity that we encountered Toi Toi – a plant which traditionally grows in or near wetlands. Confused, because we were on top of a ridge in scorching sunshine, I looked to my feet and noticed it was flat enough that the approximate area could easily be a bog if there had been any significant amount of rain in the past few weeks. There hadn’t. Jessie and Bernie at the initial clamber up to The Peak (.864). Here we stopped for a few minutes, set a new bearing, and began the climb to The Peak (.864), beginning steeply and awkwardly up the scrub but never dangerously. The climb was slow, however. Typical for today. Beginning at 12.20pm, it took nearly an hour to cover roughly 800 metres back into the trees, slightly more than 100 metres of climbing. This took us to a local high point, but not one with any visibility through trees and it wasn’t the .864 high point. 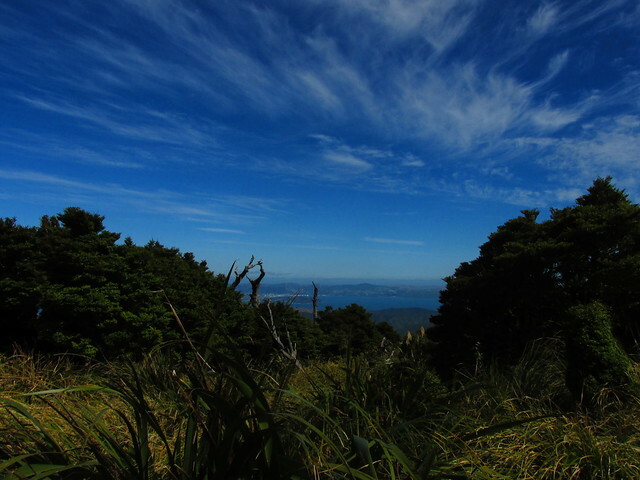 With another compass bearing to the approximate south, and some scrambling through mud, over and between beech trees, we emerged into a clearing near the summit of The Peak. It was 1.18pm, panoramic views all around, and we’d found a good place to relax for lunch. Gazing over to Tapokopoko, 2.4km away in a line of sight, it was hard to believe that it’d taken us more than 3 hours to cover that distance over a ridge which appeared very tame and covered in little more than light tussock from this height. Appearances can be deceptive. We began again after half an hour, now feeling more as if it was the journey outwards rather than inwards, and with plenty of scars to show for it. Taking another bearing, we dropped off The Peak towards the north-west, immediately into the beech forest again and next intending to sidle underneath Kotumu (.786). The forest afforded easier travel but continued to be repeatedly exchanged for chest-high scrub bashing. Something we didn’t expect, however, was to stumble upon a golf course. Well, actually just the putting green section. And there wasn’t a hole to whack anything into. But it was uncharacteristic, short green grass on a relatively flat surface. Never mind. Take another bearing. Straight into that thick wall of trees. We’re on our way again. As we approached Kotumu, we recurringly encountered another plant I’d not expected to find, and this was worse than Toi Toi. Until now I’ve only ever known Ongaonga (aka Stinging Nettle) to grow near water sources like creeks, and generally in dry enough places that other plants don’t grow and take over. 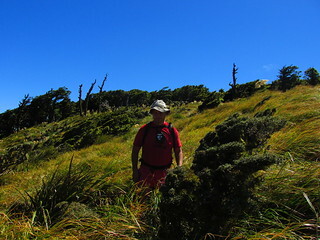 There’s plenty of it in the Rimutakas, but I’ve only known it at lower elevations. 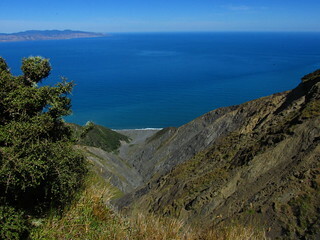 It seems, though, that Ongaonga also grows in significant amounts right on the top of the Rimutaka Range, where there are no obvious significant creeks in sight because whichever ones exist would tend to emerge from the ground and flow downhill from here. I now know that rule does not hold. I was fortunate enough to avoid being stung myself, but I think I may have been the only member of our group not to feel the pain for at least several hours. Aside from the golf course, there were few navigational issues as long as we watched carefully, were careful with the stopwatch, and stuck to bearings as appropriate. In a couple of places it appeared as if the ground was dropping away, but this always proved to be a false perception as we carried on and found it was just cases of obscured views. 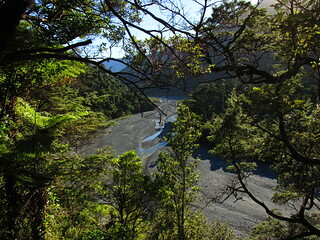 Looking down the gut of the Kotumu Stream. It’s big from the top. As the ridge narrowed, our route took us above the top of the catchment of Red Rocks Stream, which we briefly considered dropping straight into, but decided not to on this occasion as it was an unknown as to how easy it’d be, and a couple of us were starting to get short of water. Instead we carried on, to look out above the top of the massive slip which feeds the Kotumu River out to the Wairarapa coastline. This is a geographic feature for which its scale can’t be nicely conveyed in photographs. It’s huge. Bernie getting into Red Rocks Stream. By this point we’d reached the edge of farm-land. Being 4pm in the afternoon, we found the fence line, followed it along the edge of the bluffs above Red Rocks Stream (feeding the Orongorongo River), and found a combination of animal trails to drop into the steep terrain until it was possible to get into the scree and slip-slide the rest of the way down, reaching the stream at about 4.45pm. Finally, there was water. Alistair and Maarten had arrived first and were waiting. I still spent about 10 minutes drinking and throwing water over my head. At this point it may be worth pointing out that, since leaving Tapokopoko, our group had averaged a healthy speed of 900 metres per hour. From here it felt much more like a home straight. An easy drop down Red Rocks Stream taking about 40 minutes, then into an Orongorongo River with virtually no water at about 5.30pm. We should be back at Paua Hut by a reasonable dinner time. 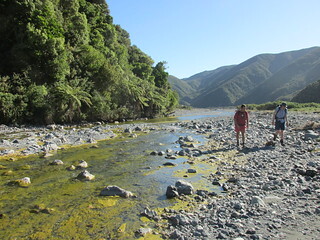 Reaching the Orongorongo River again was a stark reminder of just how dry it’s been. The river desperately needed some decent rainfall, to flush out the masses of slime that had built up on its banks. Along the way, I stare hard at the base of the spur east of height .376, looking for anything that might signify a cut track emerging in the place where Maarten thought there was none, despite what maps suggest. If it’s there it’s not at all obvious, or clearly marked. Most of the walk was, however, uneventful, except for a brief stop at an unlikely swimming hole, 10 minutes shy of Paua Hut. Upon arrival at 7.15pm we’d been expecting to find another tramping club group, with a small number of people who’d come in this morning and gone to climb Mt Matthews. They’d been and gone, leaving a note to say they might be late back. Apparently we were also late, because they coincidentally returned a few minutes after ourselves, as did a couple of other club members on their own independent evening in the hills. They set up a fly outside, noticing that nine others were already present and (probably) taking up bunk space. With Paua Hut looking to be packed, not that I needed that excuse, I once again dragged a mattress to my space some way away. This time, however, six other people either copied me or had already decided to sleep outside. In the end, between everyone there that evening, I think it was only Bernie and Jessie who remained within the hut. We cooked our pasta and mixed our custard. They cooked their haggis and drank their whisky to a Robbie Burns evening of poetry, into which we listened. All in all it was a quiet but jovial evening. Compared with the day before, Sunday was a very cruisy day. All we needed was to return to the Catchpool Valley entrance. 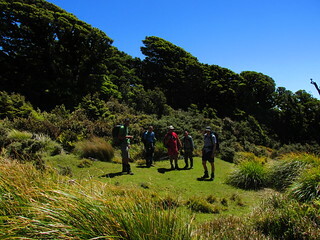 For some variety, Maarten, Jessie, WeiMin and myself elected to take the Browns Track route out, which climbs directly up the side of the ridge opposite Paua Hut, as an alternative to walking the marginally less direct (but much flatter) way via the Turere Bridge. The south-eastern side of Browns Track is narrow in places, but fairly straightforward. It’s just steep and that’s about all their is to it. We reached the top easily enough in somewhere under 30 minutes. 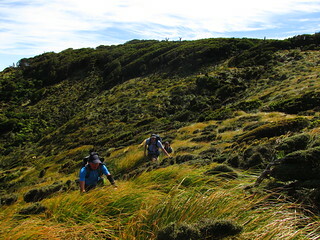 The top of Browns Track means about two metres of good, well-graded track, attributable entirely to the fact that you’re walking across the Cattle Ridge track before heading down Browns’ on the far side. The north-western side of Browns’ is not so much narrow as is the south-east. It’s more the opposite, like a ditch. When it’s wet, this side of Browns Track can be a slippery slide, but this time wasn’t so bad given how little rain there had been. On a clear day, it’s also not such a bad place to be because it’s well positioned to see many of the nearby features, such as Clay Ridge. Getting down from the top only took 15 minutes at most, and we waited some time for Bernie and Alistair to emerge from their Turere Bridge direction. As I always have so much trouble remembering exactly where Browns Track meets the Orongorongo Track, I (once again) made a mental note of the three tags which someone’s tied to a nearby tree, as well as the large tree stump on the end of the nearby bridge. Yep, I’ll remember it next time. We finally emerged at the carpark at about 9.45am. It was very early in the morning to be finishing a weekend trip, but it was also really the expedition of Saturday which made this weekend. I think all of us felt quite satisfied, if not worn out, by the effort required for some very slow travel to a place where most of us hadn’t previously been. A tiring weekend AND home in time for lunch on Sunday? What a trip 🙂 Sounds like the nav was worth doing. Given the metservice reckons Lower Hutt has only had 25mm or so of rain since you went in, I reckon the Orongorongo must be even lower by now. Hi Amelia. Thanks and yes it was satisfying. It was hard to believe how little water was in the river. In January 2014 it was doing this. Go figure. Hello. Yes it is. It’s from just below where the main Orongorongo Track hits the Turere Bridge. Great report, 900 meters per hour – thats 150 meters per 10 minute cycle not fast. Im guessing we were doing round 1200 meters per hour under the beech trees, the elephant grass really slowed us down though. Thanks Alistair. And thanks for the idea and coordination. It was heaps of fun.